The 3D apps aside, the user experience that the LG Optimus 3D offers is hardly any different from what you'd get from the Optimus 2X. Still we'll go through the LG home-backed launcher in case you missed that review. Here it is on video, for those who haven’t played around with an Optimus before. The sad part is that the LG smartphone portfolio is still stuck with Android 2.2 Froyo, despite the fact that 2.3 Gingerbread has been available for more than half an year now. Since Android 2.3 Gingerbread is not such a dramatic improvement over Froyo, we are willing to let it go for now as long as LG promises to step up its game and deliver the update quickly (minor or not, it's always better to have the update). There’s now a view mode similar to the HTC Sense leap view, where you see all your homescreen panes in one place and pressing one of them zooms in on it. This view mode is triggered by the familiar pinch zoom gesture. The available number of homescreen panes can be customized too from that view mode with any number between 1 and 7. A button lets you select any of your homescreen panes as the default one. There are four shortcuts docked at the bottom of the LG Optimus 3D screen and are visible on both the homescreen and in the app drawer. You get Phone, Contacts, Messaging and a Home/applications button. There’s a new twist to the way you place stuff on the homescreen. Upon a tap-and-hold on the display – or by hitting the add button in the menu – gridlines appear on the screen and the four docked icons get replaced by a taskbar with widgets, shortcuts, folders and wallpapers to choose from. The LG customizations continue with the app drawer. You get not one, but three different options for its styling – a side scrollable horizontal grid, a vertical grid that you scroll upwards and downwards and List view. In vertical grid mode you get icons grouped by categories, which you are free to change however you please. The notification area, one of the Android strong points, has a few tweaks as well – it’s got five switches that toggle sound, Wi-Fi, Bluetooth, GPS and auto network data. There are also music player controls docked here. All this is quite convenient. The LG Optimus 3D uses only two motion gestures - mute for the ringer and snooze for the alarm. The Optimus 2X had several more and the Optimus Black even had a dedicated button - it's odd that LG decided to remove the motion gestures, but we're not really sad to see them gone. And now we move on to what you really came for - the 3D Space app, which is the hub for all the stereoscopic action on the Optimus 3D. 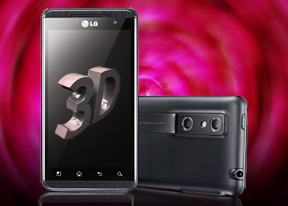 If you didn't figure it out from the name, then you should know that 3D is very important for the LG Optimus 3D. That's why the company developed the 3D space app, which brings the shortcuts to all the stereoscopic apps together in a common hub. The 3D button on the side of the Optimus 3D launches just that. It's more for show than it is actually useful but it has cool 3D interface with nice animations for each of the categories. Unfortunately, there's no easy way to demonstrate the 3D action with our camera, but here's what we came up with. Here's some animated GIF magic to give you a basic idea of the 3D effect you get. Mind you, there's no need to shake your device furiously to get the 3D thing going. We are just giving you quickly alternating images that represent what each of your eyes is seeing when looking at the Optimus 3D screen. By changing them fast enough, you get a slight resemblance of the real-life effect. The 3D Guide is a manual that will teach you how to create, view and share 3D content. You get a brief tutorial on each of the subjects, but it should be enough to teach you everything there is to know about 3D on the handset. We’ll show you more of the 3D Space as we go along the review. The dual-core 1GHz processor made the Optimus 3D a prime candidate for our battery of synthetic benchmarks. It uses a TI OMAP 4430 chipset with two Cortex-A9 cores and a PowerVR SGX540 GPU and 512MB of RAM. BenchmarkPi showed the LG Optimus 3D is on par with the Optimus 2X (no surprise here, both use Cortex-A9 cores), but put the Samsung Galaxy S II is slightly ahead and the HTC Sensation - slightly behind. Linpack has been updated and now features single and multithreaded modes. We ran the multithreaded mode, but unfortunately results aren’t comparable to those of the old version. So, we retested the Galaxy S II and Optimus 2X, but we didn’t have a Sensation to use in this test. Anyway, the LG Optimus 3D surprisingly came out ahead of the 2X and closed on the Galaxy S II. That's pretty impressive, considering the S II runs at 1.2GHz, which should theoretically give it a 20% advantage. Quadrant puts the Optimus 3D ever so slightly ahead of the Sensation, but behind the Galaxy S II. Since Quadrant does file system benchmarks, the Optimus 3D should get a boost when it moves to Gingerbread (and its faster Ext4 file system). The browser benchmarks show that LG have done a very good job at optimizing the software. The CPU-heavy SunSpider shows that the Optimus 3D and 2X share a close second to the Galaxy S II, while the Sensation lags behind.